Well Jane, I haven't yet taken a picture of my totes and my reusable bags for you, I will tomorrow post my collection lol, BUT I will also post this book that I am picking up for the kids tomorrow, and will include in the picture the bag that they get with it. Unfortunately, I was through the checkout when I saw it, and it was SO busy at Save On tonight, there was no way I was going through again! So I will pop out in the morning, because Mr K was incredibly excited about it, and so am I actually LOL! I was very disappointed that I didn't find this before all the birthdays that just occurred this spring :( I have been trying to think of some that are coming up that would like this..... WHAT a great gift! Help save the planet one bag at a time! Teach your child to be eco-friendly and conserve the earths precious resources! Its never too early to learn the importance of reusing, reducing and recycling. 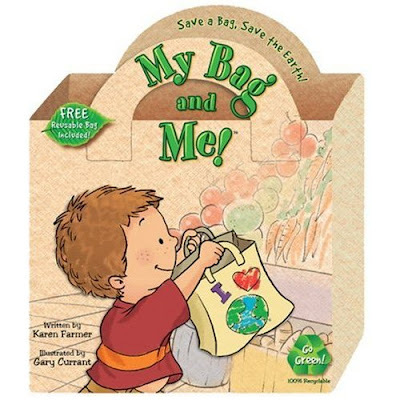 My Bag Me follows a child and his reusable shopping bag on a trip to the grocery store. By the end of the story, your child will say Paper and plastic no more!Includes a FREE reusable Tyvek shopping bag! Children can tote on their next shopping trip to show-off their eco-awareness! OMG thats brilliant!!! I HAVE to get that!!!! Thanks so much! Now my 15 year old is calling me a tree hugger though - wish I had got at HIM young!! !